weeeee! finally a full metal alchemist wallpaper! Ive been working on this for over a week. Im so sick of it...ugh. Well, the interesting thing is that I realized that the scan quality was very very bad after I extracted it. And I was too lazy to find another better quality one, so I decided to clean up the scan...I thought it was supposed to be easier! T_T Instead, it seriously took me 6 hours just to do the scan. only 20% or so of the scan is in its original content. Ed and Al looked like they were diseased before. Thank god they look so much better now! Oh, and if you even think about ripping this scan out of my wall......well, you dont even have to worry about MT coming after you...because you better start running! I'll eat your head off and hit you with a frying pan if you rip from this wall. This is the hardest wall I've ever worked on besides ~Aquamarina~. Well, I'd been planning to make a Full Metal Alchemist wall for awhile now and never got around to it. 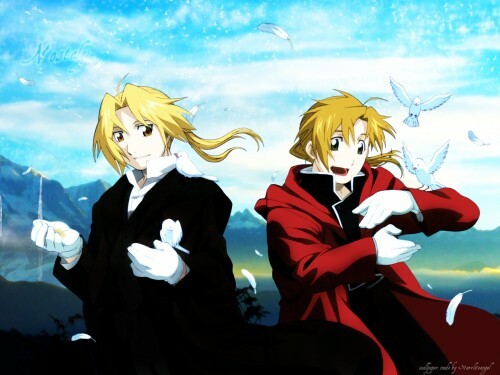 the background seems to be too fantasy-ish to me, while Ed and Al could be plonked into this world and still fit (meaning there isnt anything "fantasy-ish" about them). so that part bothers me, but I cant think of anything to do about it. I was thinking about putting wings on them......but ahh...no. just..no. this scan is definitely not a wing-addable scan. ah pooie. I really do like doing wings. wow! I saw that scan used over and over....but I think that your wall is definately one of the best! I love the bckground. ^^ You've shown a lot of effort on it too. Although a little comment on the scan : I think it is a bit too dark... considering the place they're in. Other from that, I like the wallpaper. im adding this one to my favs! Nice.... I have to say I really like your skies, in this one its crystal like & clear-blue, a ver calming & peacefull piece. I like the background great job on it. Extremadamente precioso, no cabe duda de que tienes talento y paciencia para realizar esta clase de trabajo, y por si no me entiendes - I just want to say thank you for the effort and the wallpaper. I like the background, really great job and smoot for looking, the scan look good and match too. lovely wall! i like the bg and it's clarity gives a sense of serenity and lightheartedness. very cute and vivid. Anyway, great job, and keep it up! I..tend to prefer Al to Ed, but a pic with both of them is so CUTE and AWESOME !